Hi, are you ready for some more Party Pandas? How about a Valentine’s Day Panda? That’s right! 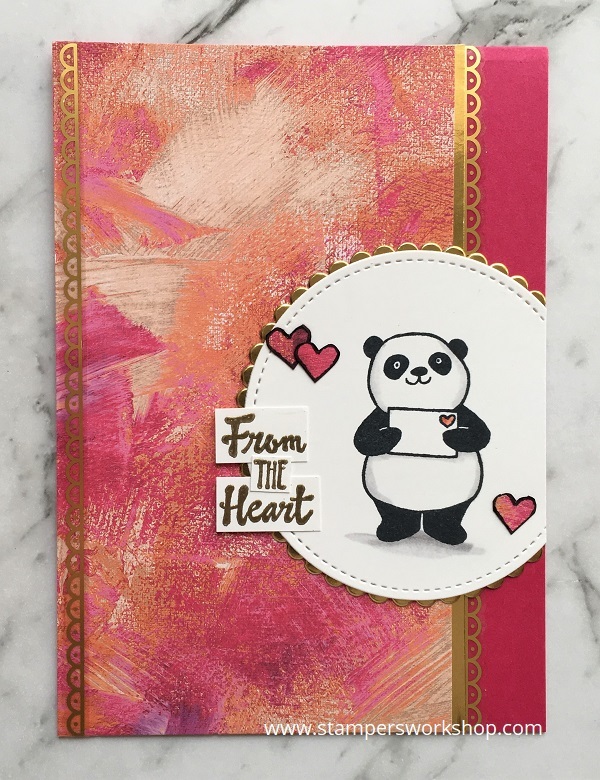 Today we are using one of the Pandas from the Party Pandas set to make a simple Valentine’s Day card. Of course, with a change of sentiment, it could be an anniversary or birthday card. I’ve used a really simple design (this is another favourite of mine) and you could easily adapt it to fit any occasion. Oh and don’t you just love the new Painted with Love Speciality Designer Series Paper? I’ve used the plain side but the other side features gorgeous gold foil accents. This paper also works really well with the Eastern Gold Vinyl stickers which I’ve used here. (There are also some coordinating stickers to go with the patterned paper which are also beautiful)! The Party Pandas stamp set can be earned for FREE with a qualifying purchase during Sale-A-Bration. All the details can be found here. Hi, today I am sharing another cute card using the new Bird Banter stamp set from the upcoming Occasions Catalogue (available to Customers from 03 January 2018 and Demonstrators from 01 December 2017). Whilst there are different birds to choose from in this set, I am still loving the toucan. I’ve coloured him a slightly different way; still using the Stampin’ Blends but you could easily use any other colouring medium such as the Stampin’ Write markers. 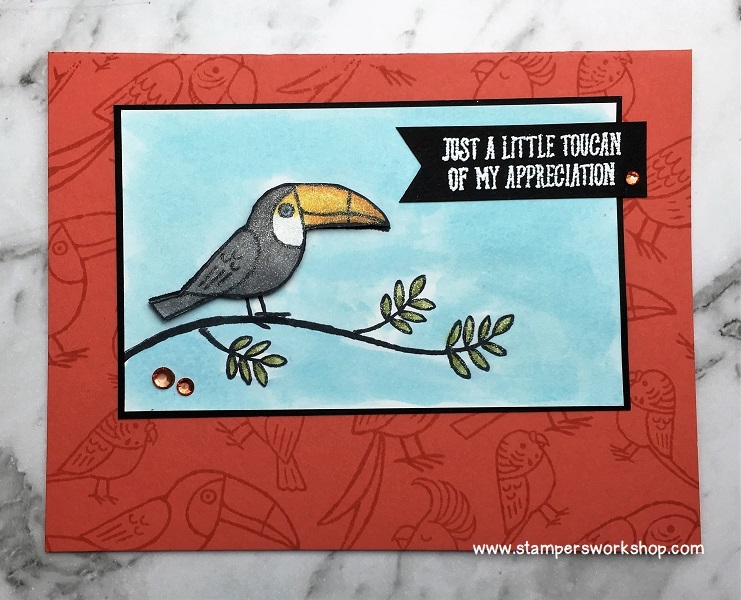 I wanted to place the toucan on the branch which also comes in the stamp set. I started by cutting a panel of whisper white cardstock to the size I wanted and then stamped the branch (in Memento ink as I am using the Stampin’ Blends to colour the image). I added some additional leaves to the branch to fill in space a little more. I stamped the toucan twice: once directly on to the panel so it looks like he’s standing on the branch and another time on a different sheet of cardstock so I could colour and cut it out. I wanted to ‘pop up’ the image with Stampin’ Dimensionals. I added some Wink of Stella to the finished bird to make him shimmer. I thought the panel looked a little stark so I added a wash of blue ink (in Tempting Turquoise) to create the sky. When the panel was finished, I adhered it to a black panel. For the card base, I stamped all of the birds with Calypso Coral ink onto Calypso Coral cardstock. I love this tone on tone look. It is subtle but effective. The panel was then adhered to this base. You could pop the panel up using Stampin’ Dimesionals but I decided against it this time. The sentiment (which was stamped and embossed in white on Basic Black cardstock) was added to the top of the image. To finish the card, I used some rhinestones (of course!) 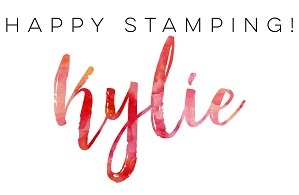 which I coloured with the Calypso Coral Stampin’ Blends markers so it matched perfectly. This really is a simple card and one you could make mass produce easily, especially if you don’t pop up the bird. I hope you’ll give it a try. 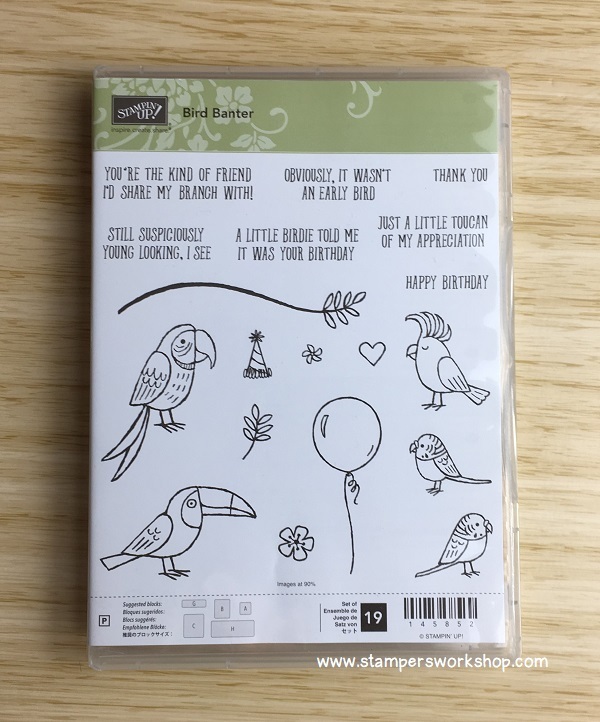 Hi, the Bird Banter stamp set is one of my favourites (of many) from the upcoming Occasions Catalogue (available to Customers from 03 January 2018 and Demonstrators from 01 December 2017). I love the great line art and the sweet sentiments. I think this set will be fabulous for all kinds of occasions…and perfect for the ever difficult masculine cards. For my card, I really wanted to go for something quick and impactful so I returned to a favourite card design. I make this style of card a lot and it never ceases to get positive feedback. I stamped the birds from the stamp set in Smoky Slate ink to create my owned patterned paper background. I mounted this panel on Basic Black cardstock and then added it to a Soft Sky card base. 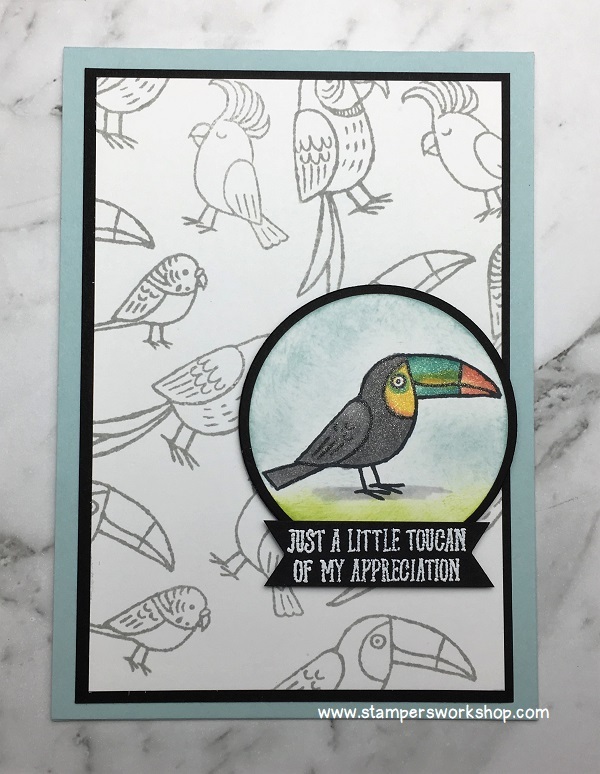 To create the focal point, I punched out a circle of Whisper White cardstock on which I stamped the super cute toucan and coloured it with Stampin’ Blends. I shaded the sky and the ground using my sponge daubers. I finished the toucan with some shimmer from the Wink of Stella shimmer pen. This panel was mounted to another circle of Basic Black cardstock. To complete the card, I stamped the sentiment and embossed it with white. A simple and effective card! I hope you will give it a try! This card design is so easy to recreate!